The type of chimney or flue you have dictates the type of fire you can have. If you’re still not sure, then take a look at your roof and compare it with the simple guide below. It’s worth remembering that a full depth fire often requires a traditional chimney or rebate on the fire surround, whilst a slimline fire will fit virtually and chimney or flue. Is easily recognised by a conventional brick chimney with chimney stack on the roof. This relies on the natural ‘pull’ to expel the products of combustion out of the chimney pot. The minimum internal diameter for class 1 is 180mm. This allows you to have most types of fires. Is a metal flue box that is situated behind the fire connecting to a series of metal flue pipes running up through the house terminating with a pipe and terminal through the roof. The internal diameter of the pipe is 127mm. There are a large number of fires available for this situation. Occasionally, the flue may have been constructed using 180mm pipe. If this is the case, the flue is classed as Class 1. These are commonly found in more modern homes. Constructed using hollow concrete flue blocks which create a flue up through the property usually terminating with a ridge vent on the roof. In most cases there is usually a flat wall where the fire goes. 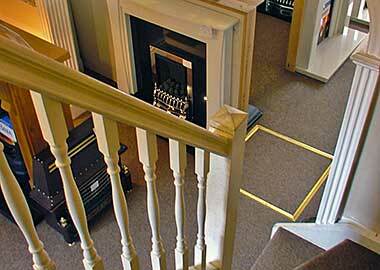 This does limit slightly the choice of fires suitable as depth can be an issue. Can’t see a chimney or a flue? If you Can’t see a chimney or a flue like the ones described above, then you will require either a Balance Flue, a Power Flue or an electric fire. Power Flue Gas Fires expel the flue gases directly outside the building through the use of an electronically driven fan unit mounted on the external wall. A sophisticated microprocessor monitors performance and automatically shuts off the fire in the unlikely event of operation failure. The fan eliminates the need of a glass front. Available on both inset and outset gas fires the Power Flue feature requires an electricity supply.